When I came to college in the United States, I was struck by major injustices that plagued a country that ranked highly for its wealth, power, and development. Amongst them, the lack of public health care, the prominence of gun violence, and the atrocities of mass incarceration provoked in me an infuriating confusion. As a senior now, I am still infuriated and stunned by the U.S. criminal injustice system, but less confused due to the privileged experiences I have had interacting directly with the system. I have spent three consecutive semesters tutoring incarcerated men, one semester in an Inside-Out class at the Massachusetts Correctional Institute (MCI) in Shirley, and I have received invaluable mentorship from Professor Hilary Binda, AG03, founding director of the Tufts University Prison Initiative at Tisch College (TUPIT). Last week I helped TUPIT host its first symposium on February 1 and 2, 2018. The Symposium, Prison and Education: The Responsibility of Engagement, provided a platform for prison reform advocates and graduates of college-in-prison programs, to speak about the significant value of education in prison programs and suggest how Tufts’ new college-in-prison program can be most impactful. As Tufts community members, it is important to learn about the experience of prison from those who are incarcerated. 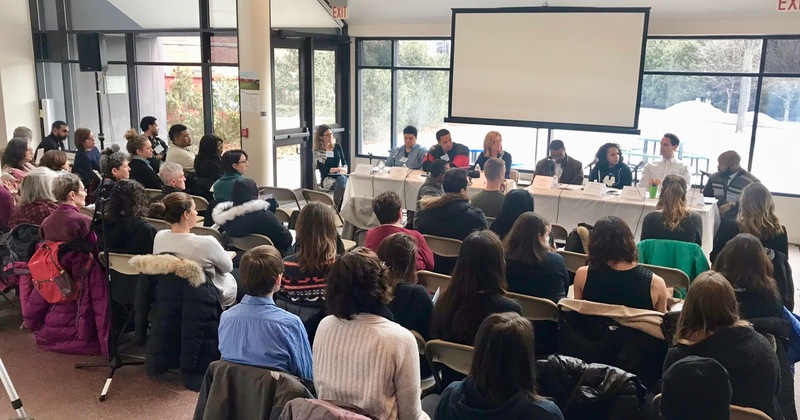 The Symposium began with five formerly incarcerated panelists speaking to roughly 80 medical students and faculty members at the Tufts School of Medicine about their experiences receiving, and being denied, proper health care while in prison. They spoke about nutrition, mental health, medication, and the logistics behind seeing a medical professional in prison or jail. Many of the medical students were surprised by what they learned about the challenges and difficulties in accessing medical care. The Tufts Medford campus hosted the remaining portions of the symposium. Andrea James, Founder of Families for Justice as Healing and the National Coalition for Incarcerated and Formerly Incarcerated Women and Girls, gave the keynote address on “Nothing About Us Without Us.” James highlighted the importance of allowing people directly impacted by the criminal justice system to lead justice reform movements. She is a strong proponent of educational programs in prison and jail and as a means to prevent the prevent the re-incarceration of women and girls and to help them maintain their freedom and care for their families. Students from last semester’s Inside-Out course read letters written by their incarcerated classmates. A panel entitled “Learning in, and in Spite of, Prison” followed the reading. Seven formerly incarcerated individuals shared the challenges and benefits of education in prison programs. All agreed that such programs are crucial for reducing in-prison violence, mental health issues, and ultimately recidivism. They highlighted that Tufts’ new college-in-prison program will vastly improve the lives of many. It was followed by a short film about solitary confinement and a panel discussion on the detrimental effects of solitary confinement. Panelists spoke about their personal experiences in solitary and the legal implications of reforming and abolishing the punitive practice. The symposium came to a close with three simultaneous workshops. One focused on legislative advocacy and activism, the other considered the implications of working in and against the criminal justice system to support education in prisons and jails, and the third engaged faculty members about teaching as a form of learning with people in prison. The future work of TUPIT is ambitious. In addition to the current Inside-Out undergraduate course being offered this Spring, Professor Hilary Binda has spearheaded a faculty-in-prison speaker series through which 16 faculty from the School of Arts and Sciences, the School of Medicine, the School of Dental Medicine, the Fletcher School of Law and Diplomacy, and the Friedman School provide readings and a two-hour lecture-discussion inside MCI-Shirley prison to a large audience of incarcerated people. To continue engaging the Tufts community, more panels, screenings, and symposiums are on the horizon. Growing up, I was not directly impacted by the criminal “justice” system. Now, by virtue of knowing the state of this system, I am certainly impacted. I reject ignorance and, with it, complicity, when human rights are systematically being violated. I fear the temptation of chosen ignorance, silence, and passivity that ensues from the privilege of not being directly impacted by mass incarceration.